Hey guys, i remember seeing somewhere on either here or facebook, a custom built pedal bicycle with a huge truck rim in the rear. anyone have any of those pics or know what the hell that type of mod/bike is called? Like this ... or something smaller ?? 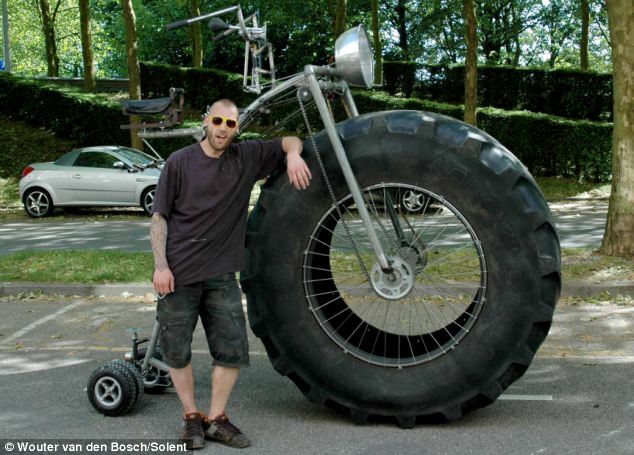 You should have tried :: """ BICYCLE WITH BIG TIRE """
in just a plain web search -or- YouTube ?? These probably are what you're looking for ... you did say IN THE REAR. i remember seeing somewhere on either here or facebook, a custom built pedal bicycle with a huge truck rim in the rear. yeah, right idea, wrong end and a little too extreme. the one i saw recently was like a 20/22" (think escalade suv wheels) in the rear, with a normal spoked wheel with pedal in the front. Go ahead and post what you find, then !! after many hours of searching, before and after posting here, i found it. That's very UNIQUE ... and COOL !! I've never seen one posted here before. Please find somemore pictures ! !